Susanne Beier, Ph.D., Dr. Elizabeth Thompson Psy.D., Brett Gordon, Ph.D. 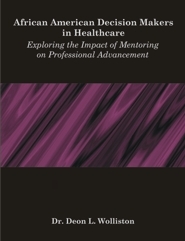 This qualitative case study explored the impact of mentoring on professional advancement among African Americans healthcare professionals. A nonrandom purposeful sample was used to identify 21 African American hospital decision makers employed in the specialty areas of nursing, medicine, pharmacy, and administration. Two central research questions were used to explore the role of mentoring on professional advancement and the participants’ perception of the importance of mentorship and empowerment on their professional advancement. Data was analyzed using Moustakas (1994) modified van Kaam method of analysis. Results of the study showed that mentoring plays an important role in the professional advancement of African American hospital professionals. Additionally, the study participants believed that mentoring empowers African Americans for professional advancement. Dr. Wolliston is the Founder and President of DLW Coaching and Professional Consulting. Her key areas of focus are on coaching and professional development. She has 17 years of experience coaching and mentoring businesses and individuals in various industries throughout the public and private sector. Dr. Wolliston’s extensive management and leadership experience in healthcare and business administration has shaped her knowledge. Dr. Wolliston’s diversified background has afforded opportunities to create unique strategies that help each client develop and achieve organizational, personal and professional goals, as well as identify and outline successful career paths. Dr. Wolliston holds a Bachelor’s of Science degree from the University of Florida, Master’s of Science degree from the University of Miami, as well as a Doctorate degree from the University of Phoenix.